8. This Country of Ours: Charles I-George III this year. Be aware that the edition for sale from Wilder Publications has no Table of Contents or chapter numbers. Public domain texts are available for anyone to copy, paste and publish, and many new companies are springing up publishing and selling these texts without editing for typos. 12. Trial and Triumph: Descriptions of some trials of the Christians may be intense; preview chapters to determine suitablity based on their student's sensitivities. If you prefer, you can skip this book and cover church history in Form 3 with a different book, Saints and Heroes by George Hodges. Leave them out, browse through them and maybe once a month pick a country that especially interests your child. Look it up (briefly) on Wikipedia or in a good Atlas. Read a little bit more about it. Find it on a map or globe. If your child is interested, he can pursue additional research in his free time and learn more about countries that particularly interest him, but this should be his own delight directed study or hobby. 24. Geography: The Following geography concepts should be explained and taught this year; a book is not necessary as these can be explained informally during walks and outings. 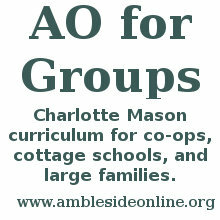 AO's complete list of geography topics is here. 26. Of what value is an old science book like Madam How and Lady Why? Apart from the superior writing quality, the best thing you can get out of old science books is a strong sense that science is a constantly changing thing, and that the "scientific evidence/theory/conclusion" of today can be debunked in a year, or two, or ten. Children should learn to take the words "Scientists think..." for exactly what they are worth (always worth considering, but never to be considered the final word). Reading older books will help you develop that sense. Note on Kingsley's "old earth" comments: During the era when Madam How and Lady Why was written, there was no "young earth" discussion out there: evidence seemed to show an old earth, and the Church of England (Charles Kingsley was a clergyman) by and large, accepted a kind of theistic evolution. Katie Barr has written a Study Guide with links for Madam How and Lady Why. The book has been scheduled slowly over two years. Madam How and Lady Why is an earth science book; if you use the study guide, you'll see that it takes time to adequately cover the subject matter. Researching the topics is what makes this useful as a science book. Cindy Gould has collected resource links. 28. The Sea Around Us: If you're curious why this book is scheduled, The Guardian has an article that describes The Sea Around Us as "the first, and still perhaps the best science bestseller. . . The reader is immersed in a new and wonderful world, one where everything really is connected to everything else. This sense of the sea and all its constituents as part of an interrelated system infuses the entire book."